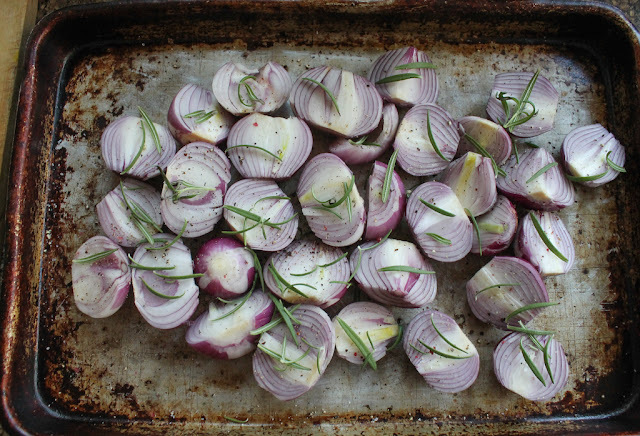 There is something about the application of heat on onions that sweetens them as they roast, drizzled with olive oil, sprinkled with sea salt, freshly ground black pepper and rosemary. Simple, but delicious. 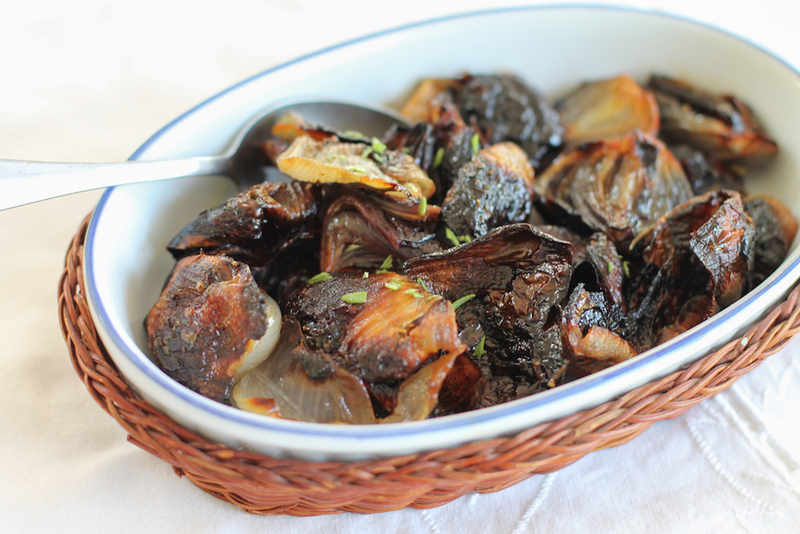 Onions are vegetables so why is it we so often use them as a flavoring for less well-endowed dishes, instead of giving them their rightful place as the star in a side dish? It’s a question I’ve been asking myself for more than 14 years, which was the first time I made this Jamie Oliver recipe for cheesy stuffed onions with bacon. 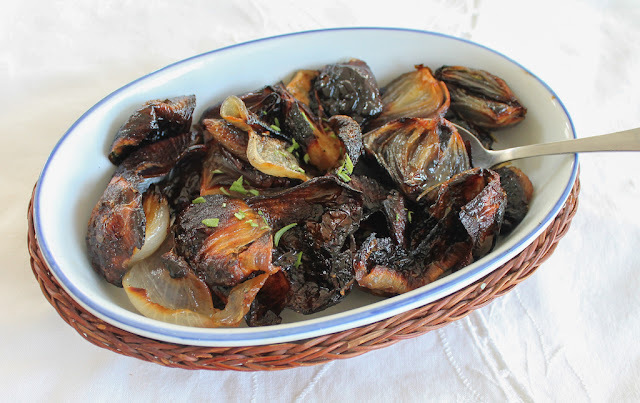 The main reason that many years ago was because my young daughters, still living at home, were not fans of cooked onions, although they both enjoyed them raw in salads. Perhaps your family is the same. Their father and I, on the other hand, love onions any way you’d like to prepare them but are particularly enamored when they are roasted. A few years ago, when we were still living in Cairo, a friend was giving a dinner party and I was roped in to help. He would handle the starters and main course and I would bring the sides and desserts. 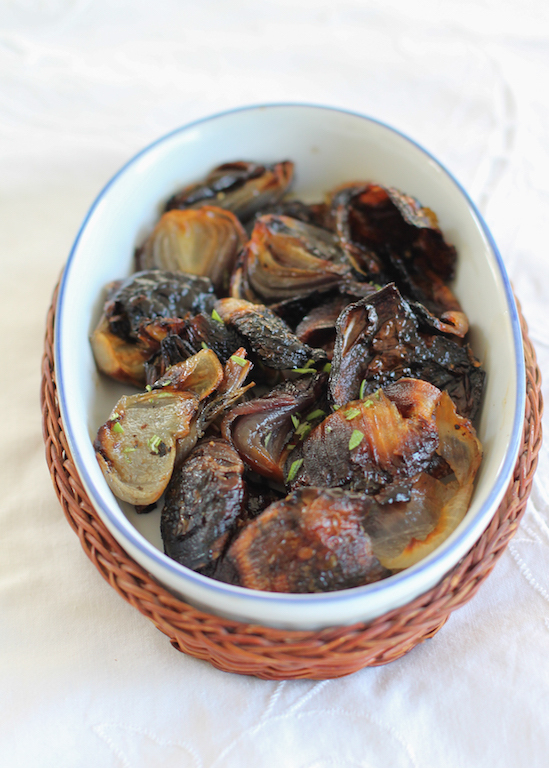 One of the things I made was a huge pan of roasted onions that had been drizzled with olive oil and sprinkled with herbs. As they roast, the onion layers separate, some pieces breaking off entirely and becoming extra crispy in the heat of the oven, others softening sweetly into tenderness. I could have eaten the whole lot before it ever made it out of the kitchen. We’ve been eulogizing those roasted onions for more than three years now. Last night I finally got around to making them again. I served them alongside some roasted chicken and they were sheer perfection. Just as good as we remembered. Which is somewhat of a relief. Preheat your oven to 375°F or 190°C. Peel your onions and cut the smaller ones in half. Cut larger ones in three or four pieces. Set them cut side up on a large baking tray. Sprinkle with sea salt and freshly ground black pepper. 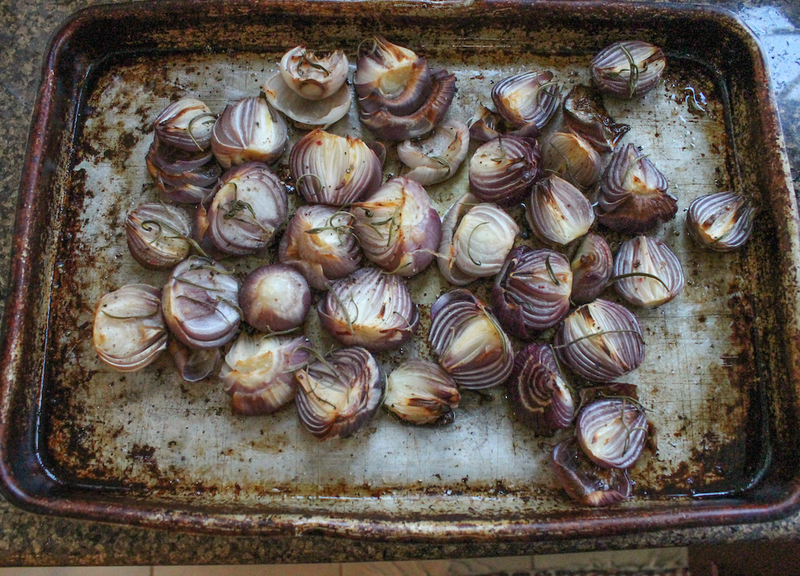 Pull the leaves off of the rosemary and sprinkle them on the onions as well. Drizzle everything generously with extra virgin olive oil. Pop the pan in your preheated oven and set the timer for 30 minutes. When the timer goes off, have a look at the onions. If the edges are just beginning to turn brown, leave them another 15 minutes on that side. When that time is up, take the pan out of the oven and give the onions a gentle stir. Some of the outer layers of the onions will come loose, but that’s okay. 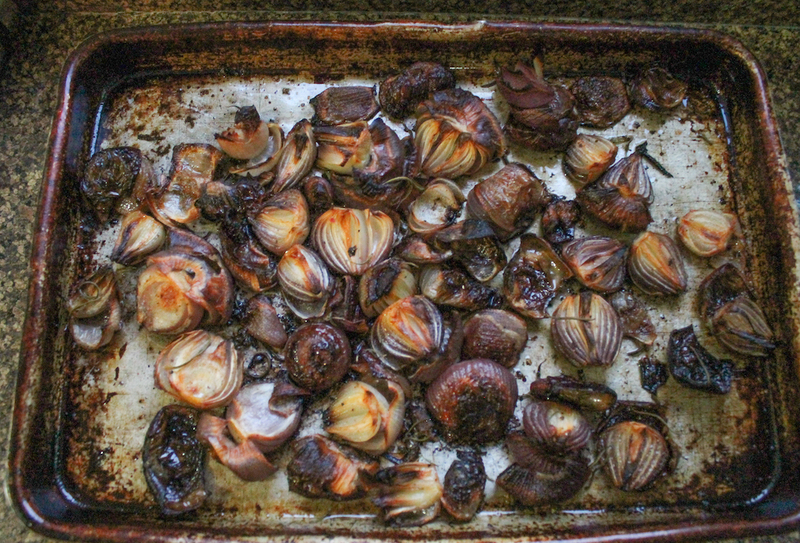 Put the pan back in the oven for another 15-25 minutes, checking periodically so that the onions don’t burn. You want them very dark in some places, crispy in others but still with some soft insides showing. Remove them from the oven and taste for seasonings. Add more salt and pepper, if needed. 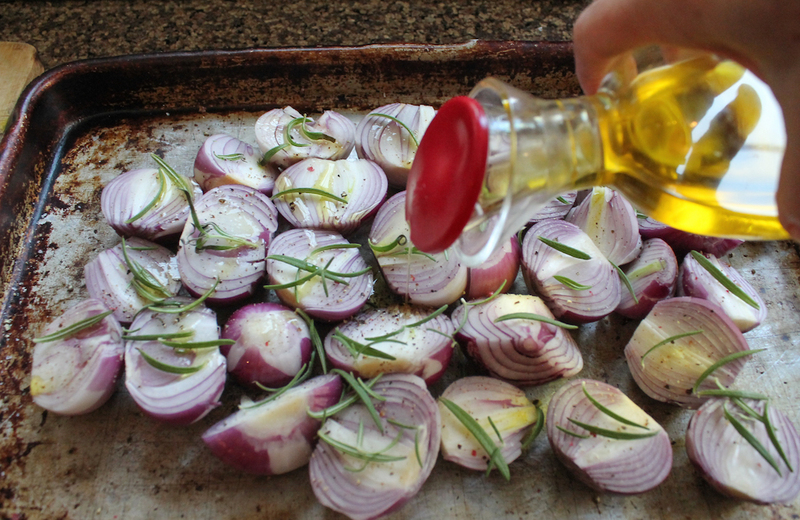 Sprinkle with a little more chopped rosemary, if desired.